Depicts land assigned to the Delaware, Miami, Kickapoo, Ottaway, and Pottawatomie Nations before they were forcibly removed to the Indian Territory. This is an 1828 Anthony Finley map of Indiana. The map depicts the state and the region from the Michigan Territory and Lake Michigan to Kentucky and from Illinois to Ohio in Finley's classic minimalist style. Rivers, roads, canals, and some topographical features are illustrated. Color coding is present at the county level, which allows for easy differentiation between counties. 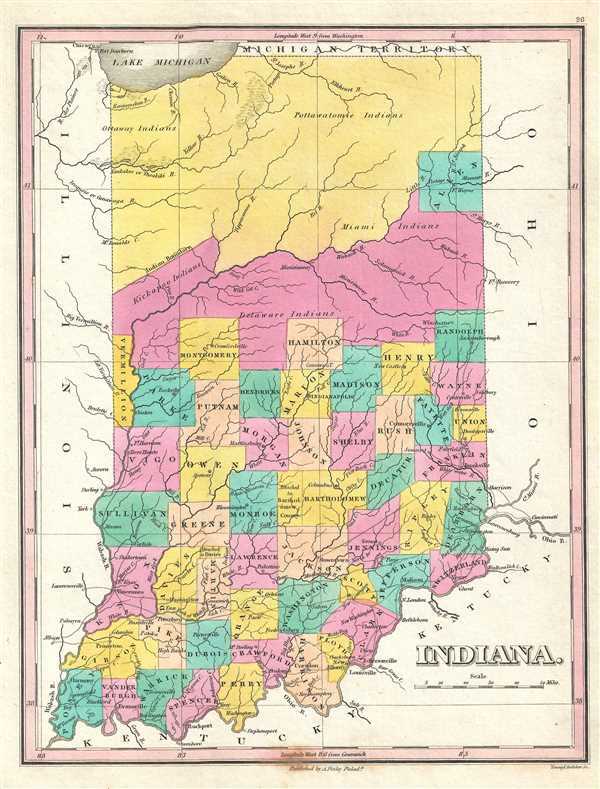 Finley's map of Indiana is particularly interesting and important due to its portrayal of the rapidly changing American Indian situation in the northern part of the state. In 1827, northern Indiana was a confined territory assigned to the Delaware, Kickapoo, Miami, Ottaway, and Pottawatomie Indian nations. The Delaware tribe, which originally occupied the Delaware River valley near Pennsylvania and New Jersey, is here shown in a middling stage in its forced migration westward. Most of the other tribes noted, including the Miami and Pottawatomie, were inhabitants of this region when the first Europeans arrived. Within a few short years of this map's creation, most of these tribes were forcibly removed to the Indian Territory, modern-day Oklahoma. This map was updated yearly from 1824 to the mid 1830s. A full series of these maps is a powerful illustration of both the American Indian relocations and the Westward Expansion. Rumsey 0282.030 (1827 edition). Phillips (Atlases) 4314, 760, 752, 6045.